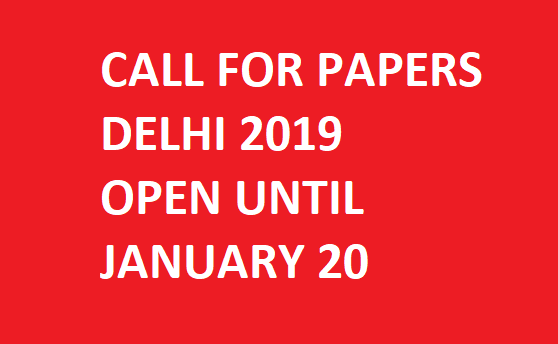 Call for Abstracts: Delhi 2019 Conference! Instructions for individual paper abstract submissions. If you would like to submit your abstract for participation in any one of the selected panel/stream sessions, please send your abstract directly to the Convenor at the email-id listed here (and cc-d to rc21delhi@gmail.com). You may ask the convenor for details on the panel/stream theme. We will also be uploading the abstracts of the panels/streams over the next two-three weeks on this website. For those submitting abstracts to panel/stream convenors, each abstract submission must be accompanied by Panel or Stream Number (P1, P2.. or S1, S2..), Panel or Stream Name (where panel is part of a stream), Author last name in the Subject Line. The abstract must not exceed 300 words and should clearly indicate the title of the paper, research questions, theoretical contribution and connection to the panel theme. Author details about institutional affiliation must also be included. For those submitting abstracts which are not aimed at the selected sessions, please indicate the conference theme/sub-theme that you wish to be considered under and the author last name in the Subject Line. Please include a small paragraph that states explicitly how your paper fits with the themes/sub-themes of the Concept Note. Please follow the rest of the instructions as given above. We welcome high-quality abstracts from all regions of the world focusing on themes/sub-themes covered by the Concept Note. Please note that we will be unable to process abstracts that do not meet the above guidelines. All individual participants interested in participating in your convened session will be in direct contact with you for panel information and will send abstracts directly to you. Please remember that the last date for you to receive abstracts is 20th of January 2019. If your session is a Round Table or a Book Discussion, you may invite participants, preferably not all from the same institution or country, and request their registration in due course. Note: Some convenors had submitted names of panelists with their proposals. Please do note that our conference policy does not allow pre-selected panelists and will adhere strictly to the policy of open call and selection. We apologise for any inconvenience and we would appreciate if all convenors follow this principle in their choice of panelists. Conveners will co-ordinate and supervise the deadlines for full paper submission by your panelists, wherever required, to your discussants. Stream conveners may chair or select chairs for their respective session(s). Chairs or discussants do not present their own work in any panel. Participants in the conference can appear in the program once as organiser of a panel (convenor) and a presenter (in another panel to which they submit an abstract in the open call) or as a discussant. Registration details and fees structure will be available on the website soon. Please send submissions by the deadline of 20th January 2018 to the convener(s) and cc your submission to rc21delhi@gmail.com. We look forward to welcoming everyone in Delhi!